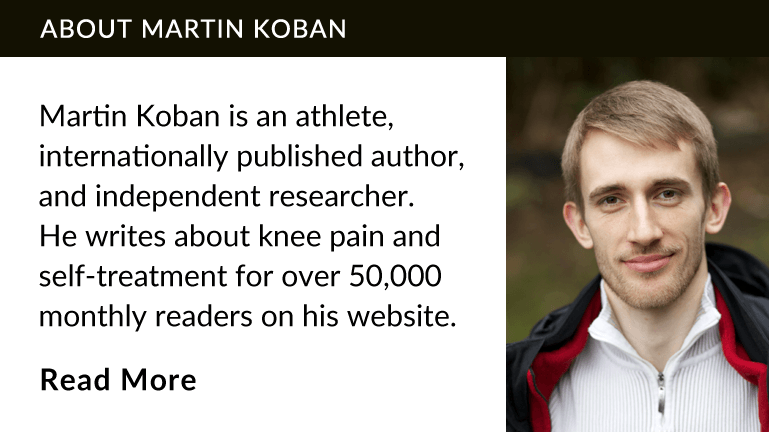 Years ago, when I was dealing with patellar tendonitis, I bought every book on knee pain I could find on Amazon.com. I thought that since these books had been written by Doctors, they would give me the answers I needed to get rid of this annoying injury. 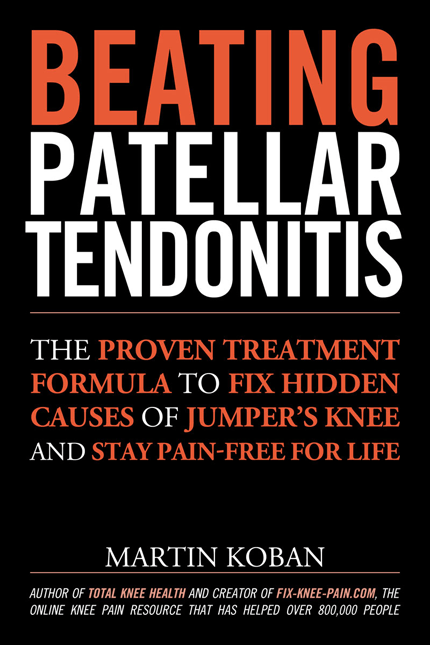 I was extremely disappointed after I realized that these books only spend one or maybe two pages talking about patellar tendonitis. I had spent so much money on this! The price of the books, shipping to Germany, custom’s fees … probably close to $300, only to learn about surgeries I wasn’t interested in at all. What a waste of time and money! Something else bugged me even more. Many of those books provided exercises and stretches for knee pain, but not one single book had acceptable instructions on how to do these drills. The pictures were too small and the descriptions lacked detail. It felt like the authors had never done these drills themselves. If any of their readers ever did those exercises the right way, it would be by coincidence, not by design! The saddest part is that there are great stretches for patellar tendonitis, but I found there was only one group of people that did them the right way: personal trainers. In today’s article I will show you how to do these great stretches for patellar tendonitis the right way. These were three great reasons why training hip muscles is so important if you want to get rid of patellar tendonitis permanently. If you’ve missed that article, you can read it here. The stretches I will show you in a moment work and hand in hand with hip strengthening exercises to help heal your patellar tendon. This is because the hip muscles we’ve trained with the hip exercises have partner muscles (antagonists) that create movement in the opposite direction. If the antagonists of the gluteal muscles we trained yesterday are tight, the gluteals won’t be able to do their job properly. In other words, today’s stretches will allow your hip muscles to be at their job. Together with the strengthening exercises, these stretches give you an extremely effective 1-2-punch to get rid of patellar tendonitis by solving the 3 major problems caused by weak hip muscles. Let’s get to it! I’m sure you’ve seen this stretch before. Unfortunately, many people waste their time doing this stretch the wrong way. This drill won’t help you at all if you do it incorrectly, so please take the time to learn it properly. Assume a lunge position with your rear knee directly under the hip and the stick nearby on the ground. At this step, there should be no tension in your hip. Place a pillow or a folded blanket under your knee if you’re on a hard surface. Move your back so that the stick touches your tailbone, your upper back, and your head. Make sure your lower back is gently touching the two fingers you’re using to hold the stick. Many people leave too much space between the stick and the lower back when they do this stretch. You should be able to fit two to four fingers in the space between the stick and your lower back. If you can slide your hand through, there’s too much space. This commonly happens to women because of the way their bodies are built, but it can happen to men just as well. Tensing up your buttocks muscles and bracing your abs will tilt your hip backwards and help you correct this mistake. If you’ve moved into the stretch already, make sure to relax again. We’re still in the starting position, with your knee directly under your hip. Another mistake is losing contact between the stick and the tailbone. This indicates that you’re performing the stretch by leaning with your torso, which makes it look as if you’re doing the stretch, when in fact you’re merely wasting your time. Make sure you maintain all points of contact throughout the stretch to prevent mistake #2. When starting, you’re in a lunge position with your rear knee under your hip and the stick behind your back. The stick is touching you at the tailbone, between the shoulder blades, and your head. Additionally, you have a few fingers between the stick and your lower back. Your lower back is touching these fingers gently. Next, you tighten the buttocks muscles of the rear leg, as well as your abdominal muscles. Imagine you’re bracing for a punch. You’re doing this to prevent your hip from tilting to the front. Now, move your hip forward so that you feel a stretch on the front of the hip. You can visualize your hip being a big bowl filled with water. If you tilt the bowl forward, the water will spill. Your goal is to move the bowl forward without spilling the water. Observe your body closely and you will see what I mean. Remember the maintain contact with stick at your tailbone, your fingers at the lower back area, between your shoulder blades, and your head. This is the point where most people make one of the two mistakes I’ve mentioned earlier. Chances are you’ll find this stretch difficult to do with these strict technique guidelines. That’s completely normal in the beginning, so don’t become discouraged. After a few tries you will get the hang of it and your brain will remember how to fire the muscles at the hip to create the desired movement. There are several ways how you can perform this stretch. You can hold the stretch position for around two minutes, while tensing your buttocks muscles. Alternatively, you can move into the stretch for a few seconds and then relax again (repeat for one or two minutes). Experiment with what works best for you. I usually change the method I used once it gets too boring. Don’t forget to do both sides. You should do this stretch every day. For best results, do it two or three times per day. Once you’ve learned how to do this stretch correctly, you can do it without the stick. After doing the basic hip flexor stretch for a few days, you should be able to judge the alignment of your back without the help of the stick. Once you can do the basic hip flexor stretch correctly without the stick, you can move on the advanced version. Don’t try the advanced version before you’re able to do the basic version correctly without the aid of the stick! The basic hip flexor stretch works the muscles on the front of the hip. With the following advanced version, you’ll also stretch your rectus femoris muscle. If you have patellar tendonitis, chances are this muscle is tight. Stretching this muscle will take stress off the patellar tendon, as the rectus femoris attaches to the kneecap, which connects to the shinbone through the patellar tendon. So, by making sure the rectus femoris is more relaxed, we can “feed slack” to the patellar tendon, which relieves some pain. To do the advanced hip flexor stretch, assume a lunge position and place some padding under the knee of the rear leg. Next, reach back and grab the ankle of the rear leg. Now, pull the ankle up to your hip. When I first started doing this stretch, I found the ground pressure on my knee to be uncomfortable. However, I was able to find an acceptable position by moving around a bit. If you find the starting position to be uncomfortable for your knee, experiment with more padding and slightly different knee placement. Once you’re back in the upright position and holding on to your ankle, tighten the buttocks muscles of the rear leg and brace your abdominal muscles, as if you’re bracing for a punch. Now, move your hip forward, so that you can feel a stretch on the front of the hip and thigh of the working leg. The common mistakes for the advanced hip flexor stretch are the same as for the basic version. You have to maintain good back alignment and don’t let the curve in your lower back become excessive. Don’t cheat this stretch by tilting your upper body either. In this stretch, you upper body has to remain upright and your spine shouldn’t move. The only parts of your body that are changing alignment are your legs. Remember the water bowl analogy from the basic stretch to help you visualize the desired movement. If you can, have a partner hold the stick to your back to check your alignment. Ideally, you should do these stretches at least twice per day. Make sure you massage your leg muscles before doing them. Do the basic stretch for about two minutes on one side and then take a one-minute break. During that break, stand with your back to a wall and pull your knee up as high as you can, just using the muscles of your hip. Hold this position for about a minute and don’t let the space between the wall and your lower back become too big. Now repeat the basic stretch on the other side for about two minutes. After that, perform the wall hold on that side as well. The purpose of the wall hold is to strengthen the hip flexors on that side of the leg, as hip flexors are sometimes tight and weak, in which case it’s important to strengthen them. If you have time, repeat these steps a second or a third time. Alternatively, move on to the advanced version. Do the advanced stretch for about two minutes per side. Don’t forget to take a one-minute break during which you do the wall hold. The hip flexor stretches will relief pain by taking stress off your patellar tendon. These stretches are beneficial in so many ways, which is why it’s important to do them correctly. Take the time to learn them and your knees will thank you.